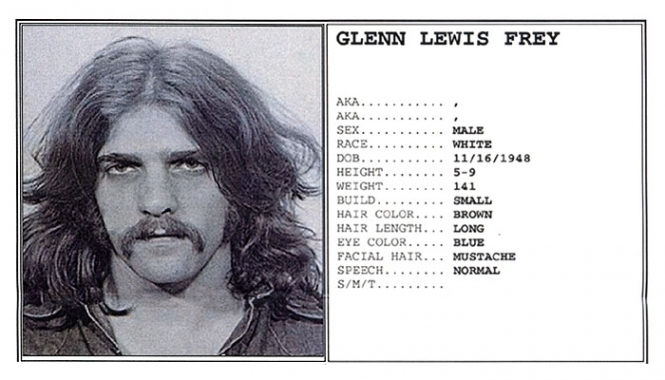 Eagles guitarist Glenn Frey was arrested by Columbus, Ohio cops in May 1973 on drug possession and public intoxication charges. Submitted by SpecialEd on Fri, 2011-06-03 00:00. Submitted by cactusdr on Wed, 2010-12-01 08:20. He's only 5'9"? During his brief stint on network TV he looked much taller. Submitted by Shelly Shores on Tue, 2010-08-31 05:20. God he was hot back in the day!!! Not to mention a fantastic guitarist!! !